Hi there! Today I’m sharing my review for a new contemporary M/M romance from GB Gordon. 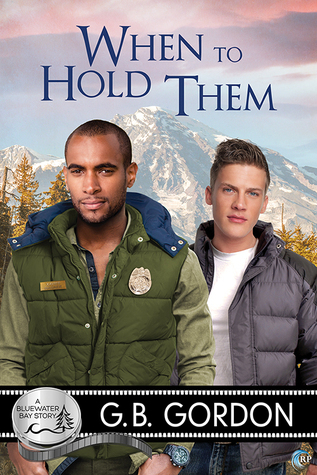 WHEN TO HOLD THEM is a book in the Bluewater Bay universe–which is loosely connected to the other books in the series (STARSTRUCK, LONE WOLF, HELL ON WHEELS, THE BURNT TOAST B & B, and WEDDING FAVORS) but fully enjoyable as a standalone. I’ve loved other GB Gordon books, SANTUARIO and THE OTHER SIDE OF WINTER, so I was excited to read this one! Doran is 22 y/o man with a gambling addiction. He ran up some substantial debt to a card shark, and then embezzled money from his uncle’s clients in order to pay it back. This was doubly hard to do as Doran respects his uncle greatly–he took Doran in after his mother disowned him for being gay. Doran tries to comply with his parole agreement, attending GA sessions and working at his job in the tourism office redesigning the Bluewater Bay website and travel brochures. He sets aside some of his weekly allowance to repaying his uncle, but the urge to gamble is strong. In fact, the only urge that even compares is Doran’s obsession with catching sight of a local forest ranger whose truck appears at the gas station across the street from his office every Sunday afternoon. One Sunday Doran’s too overwhelmed to simply observe–he enters the gas station to buy his lunch at the same time Officer Xavier Wagner is chatting up the attendant. And, a few days later, Doran can’t help sneaking a peek inside Xavier’s truck. It’s a miracle to him that Xavier is polite. Xavier is a man between worlds. Son of a German emigre and a black woman, he’s not “black enough,” and he’s not “straight enough” for his mother’s conservative church. He lives in a cabin in the woods, preferring solitude–though he’d make an exception to bringing home the man-child he caught snooping in his truck. The desires that awaken when he’s near Doran almost scare Xavier–he wants to have him, to own him, and Doran is (even more frightening) into it. Xavier doesn’t tolerate secrets or lies, so he’s put off when Doran’s evasive about his personal history. Doran’s so anxious to not be a cast off that he comes to terms with his inner steel, and stands up for himself, which was great to see. The dynamic that is developing here is one of limited D/s with many hints at it going further as more trust develops. The gambling addiction made for a nice character development with Doran–his ability to be so “all in” with Xavier, his impulsiveness, his remorse and “getting it” about chasing the thrill. All of those rounded Doran out nicely. I had wanted a bit more steam. The sexytimes were nice, but felt whitewashed and ephemeral, removing me from the players which was mildly disappointing. Still the mountainside hunt was an interesting plot point. I appreciated how Xavier took great care of Doran, and left the story feeling as if these two were going to make it long-term. Yay! Interested? You can find WHEN TO HOLD THEM on Goodreads, Riptide Books, Amazon, Barnes & Noble and AllRomance. I received a review copy of this book via NetGalley. Sounds interesting. Sorry it wasn’t steamier.